Exmouth to Meekatharra via Mt Augustus, in the Gascoyne region, Western Australia. 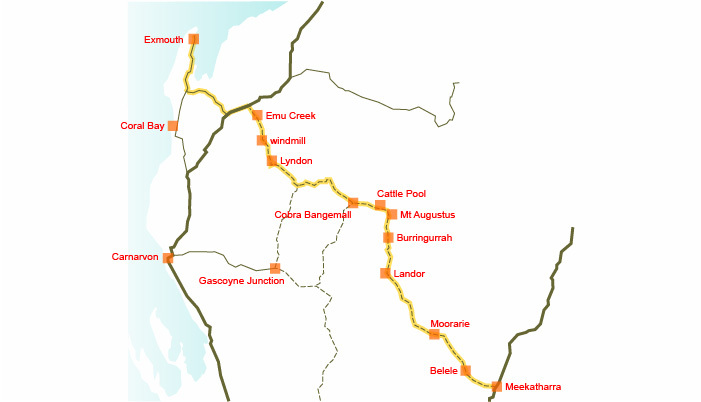 The suggested route from Exmouth is Burkett Road, the 34km of Highway 1, all sealed. Turn off before the Yannarie River onto the well marked Towera Road which transforms into Lyndon Towera Road, Lyndon Minnie Creek Road, Ullawarra road to link to Cobra Gifford Creek Road. Not much traffic out here, the main Mt Augustus tourist route is from Carnarvon via Gascoyne Junction. From Mt Augustus the route is more obvious. The Hema Mid West WA, scale 1: 1,250,000, is essential. Has a detailed map of Mt Augustus showing the walks at a scale 1: 150,000. The alternative QPA Gascoyne Mid West, scale 1: 1,300,000 is also good, showing and naming more of the minor tracks but suffers from minor mislocations of features. Available in many larger town newsagents and service stations, Hema $9.95 rrp, QPA $6.95rrp. Allow 10 days riding to average about 85km a day and an extra day at Mt Augustus to climb the hill. It could be traversed quicker, wouldn’t be hard to crank out 100km+ a day on these roads with an early start. Spring is the obvious time when the amazing wildflowers blanket the landscape but really any time April to October inclusive. It’s way too hot in summer. Exmouth to Meekatharra via Mt Augustus, Western Australia route in orange. Water supply points shown. The nearest bike shop is in Geraldton a long, long way off, some spares available in Exmouth at the sports shop and the Meekatharra odds and ends store. From Exmouth the first 200km is on sealed roads with plenty of accompaniment, roadtrains, geriatric caravan drivers etc. Once you turn off onto the dirt on Towera Road there’s only occasional cattle station traffic, and a few tourists off to Mt Augustus, not that much reason for heavy vehicles to use this road, and the road surface is therefore above average quality for most of the way. Well, like all roads it can vary from vary from being like a clay tennis court, ie, fantastic riding, to run of the mill Outback roads, ie, just good, to somewhat chunky gravel, ie, not so good, plenty of vibration. More traffic as you head south from Mt Augustus to Meekatharra and the road surface tends to being that chunkier gravel. The track in the Mt Augustus National Park area is harder work, sandy but always rideable, fat tyres will be appreciated. The last 25km into Meeka is sealed for some reason. Exmouth, Burringurrah, (population about 120) and Meekatharra have a standard town supply, ie, safe for drinking from the tap. Cobra Bangemall roadhouse, no longer a working property, and Mt Augustus Tourist Resort have drinkable water, and beer. After that there is little choice in the water department and you will need to be resourceful, there’s a few working windmills along the road, but asking at the cattle stations is often the best option, in general they are big friendly places, ie, 20 or so people living there and there’s often the opportunity to catch up on conversation and a cuppa. The one area that needs some caution is around Towera Station, the homestead has burned down completely and the station is now owned by Lyndon. Either call in at Emu Creek, they have tourist facilities there or load up at a windmill about 10km south of the turnoff to Maroonah Station. Water from the permanent waterhole at Cattle Pool requires filtering, it’s rather green. The Lyons and Murchison Rivers may have some slightly salty pools remaining from the last rain. The other creeks in general are either in flood or dry sandy beds. Two large IGA supermarkets in Exmouth keeps the prices competitive. IGA supermarket in Meeka also has a comprehensive selection. Not a whole lot in between, in fact the community store in Burringurrah has closed. Cobra roadhouse and the Mt Augustus Tourist Resort have a limited selection of expensive basics. Upmarket campgrounds in Exmouth are geared to grey nomads and the whale shark watchers, $30 per site. There are several backpackers, Blue Reef, nice, the cheapest at $30pp. Campground at Meeka is basic and right on the highway although there is some grass and a decent laundry, ($10pp). Camping at Cobra, ($15/ $20), and Mt Augustus, (dunno, about $20 per site). Camping is otherwise not permitted in the National Park, ie, Cattle Pool, not saying anything but who would know? Good bush camping just about anywhere, no limit to the possibilities, all with plenty of firewood around. Major feature is the Mt Augustus National Park with various climbs, including the recommended summit walk for some expansive views, allow 4 hours to stretch those other leg muscles, Cattle Pool, a kilometre long permanent waterhole and the Petroglyph walk. The historic 1880 Mt Gould Police Station has been somewhat restored 20 years ago and is a shady spot to lunch or camp although the windmill may be out of action, ie, no water. The usual need for self reliance here, there is the possibility of less than 5 passing 4WDs a day on this road up in the north, well, ain’t that why you are there. Pack enough supplies or you may arrive hungry. Plan the water stops particularly in the north. Carry all the spares you might need. Ie, the usual advice. Ain’t so many who have written about this particular route but my blog from my own travels starts here: Back to Exmouth: just breezing it in.